Let us put on his grace, then, or, rather, his very self: As many of you as have been baptized in Christ, have put on Christ.. Then we can make of ourselves a path for his feet to tread, and shout each day what the children sang: Blessed is he who comes in the name of the Lord: the King of Israel. A hymn composed by Theodulf bishop of Orleans, when prisoner at Angers, by order of Louis the Good. 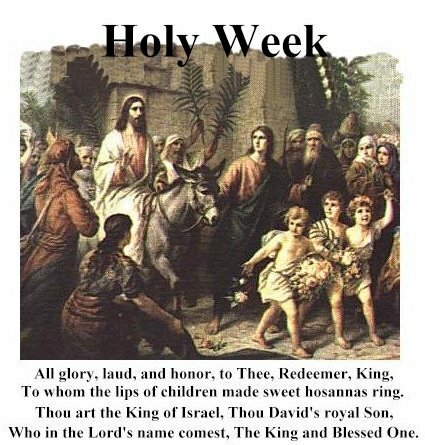 Sung during the procession on Palm Sunday in the Tridentine Rite.